How to make Random Forests more interpretable? I actually want to plot a sample tree. So don't argue with me about that, already. I'm not asking about varImpPlot(Variable Importance Plot) or partialPlot or MDSPlot, or these other plots, I already have those, but they're not a substitute for seeing a sample tree. Yes I can visually inspect the output of getTree(...,labelVar=TRUE). First (and easiest) solution: If you are not keen to stick with classical RF, as implemented in Andy Liaw's randomForest, you can try the party package which provides a different implementation of the original RF algorithm (use of conditional trees and aggregation scheme based on units weight average). Then, as reported on this R-help post, you can plot a single member of the list of trees. It seems to run smoothly, as far as I can tell. Below is a plot of one tree generated by cforest(Species ~ ., data=iris, controls=cforest_control(mtry=2, mincriterion=0)). 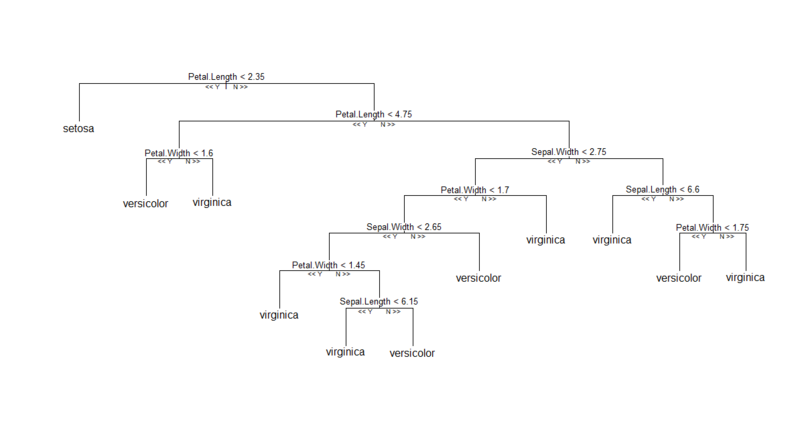 Second (almost as easy) solution: Most of tree-based techniques in R (tree, rpart, TWIX, etc.) offers a tree-like structure for printing/plotting a single tree. The idea would be to convert the output of randomForest::getTree to such an R object, even if it is nonsensical from a statistical point of view. Basically, it is easy to access the tree structure from a tree object, as shown below. Please note that it will slightly differ depending of the type of task--regression vs. classification--where in the later case it will add class-specific probabilities as the last column of the obj$frame (which is a data.frame). Then, there are methods for pretty printing and plotting those objects. The key functions are a generic tree:::plot.tree method (I put a triple : which allows you to view the code in R directly) relying on tree:::treepl (graphical display) and tree:::treeco (compute nodes coordinates). These functions expect the obj$frame representation of the tree. Other subtle issues: (1) the argument type = c("proportional", "uniform") in the default plotting method, tree:::plot.tree, help to manage vertical distance between nodes (proportional means it is proportional to deviance, uniform mean it is fixed); (2) you need to complement plot(tr) by a call to text(tr) to add text labels to nodes and splits, which in this case means that you will also have to take a look at tree:::text.tree. If you can manage to convert the above table to the one generated by tree, you will probably be able to customize tree:::treepl, tree:::treeco and tree:::text.tree to suit your needs, though I do not have an example of this approach. In particular, you probably want to get rid of the use of deviance, class probabilities, etc. which are not meaningful in RF. All you want is to set up nodes coordinates and split values. You could use fixInNamespace() for that, but, to be honest, I'm not sure this is the right way to go. Third (and certainly clever) solution: Write a true as.tree helper function which will alleviates all of the above "patches". You could then use R's plotting methods or, probably better, Klimt (directly from R) to display individual trees. I'm four years late, but if you really want to stick to the randomForest package (and there are some good reasons to do so), and want to actually visualize the tree, you can use the reprtree package. And there you go! Beautiful and simple. And then potentially use realtree with other tree plotting packages such as tree. I've created some functions to extract the rules of a tree. Not the answer you're looking for? Browse other questions tagged r data-visualization random-forest cart or ask your own question. What is the best statistical method for assigning cases to one of two groups? Residual plot for regression tree: What should it look like?